Increase your vocabulary and you’ll make your writing much more precise. That’s why I provide a word of the week. Today’s word: paresis. I almost tried to write today’s post in rhyming couplets. 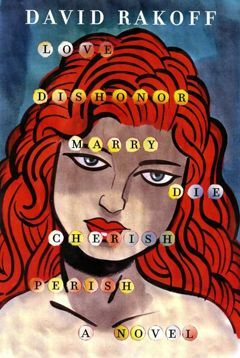 This is because my word of the week comes from the marvellous rhyming novel Love, Dishonour, Marry, Die, Cherish, Perish written by David Rakoff. A true work of art before the his final adieu. The word “adieu,” refers to Rakoff’s untimely death in 2012, from cancer, at the age of 47. I am sad that we lost this marvellously gifted author so early and even sorrier that I was unfamiliar with his work while he was alive. This quirky, interesting novel is hard work to read — the challenge of reading rhyming couplets is greater than it appears — especially when they are written by someone with Rakoff’s erudition. But I found the book engaging and charming and I intend to read it again. And stumbling, half-blind in his boozy paresis. He crossed the room and falls into the bed. The world let go of David Rakoff far too soon.